The Cocoon Apothecary Petal Purity Facial Cleanser is a gentle cream cleanser for normal, dry, mature, and sensitive skin types. It removes oils, dirt and make-up without stripping skin of essential hydration. 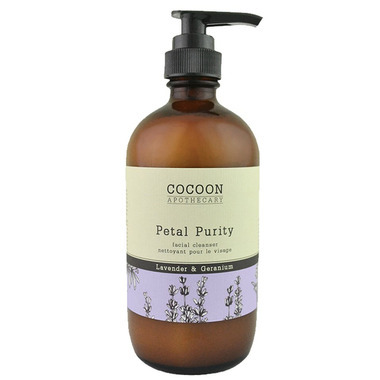 Contains the purifying extracts of organic lavender and geranium to keep skin cleansed and balanced. The organic oils of virgin coconut and sweet almond help to remove pollutants, leaving skin dewy-fresh and tingly-clean. Deep cleans and purifies without stripping skin’s natural barrier. Keeps skin balanced and blemish-free. Directions: Apply to dry or damp skin and massage in circular motion to entire face. Remove with cotton ball or water. Ingredients: Purified water, certified organic sweet almond oil, jojoba beads, certified organic virgin coconut oil, cetearyl alcohol (plant-based), stearic acid (plant-based), glycerin (from non-GMO canola), certified organic geranium essential oil, certified organic lavender essential oil, sodium anisate (from basil), sodium levulinate (from non-GMO corn), sodium cetearyl sulfate (plant-based), vitamin E, glyceryl caprylate (from coconut). I have tried other facial cleansers recently and I am now back to buy petal purity, it is by the far the best I have tried. I have very sensitive dry skin, this cleanser leaves my skin clean and soft, with no irritation. Works so well for me. This is my favourite facial cleanser. It feels like silk on your skin and smells amazing. I love how my face feels while using it and after I wash it off. It also feels great knowing that I'm not putting unnecessary chemicals on my skin. I will continue to buy and recommend this. I am dry, sensitive and thin skin. I am the first time tried Cocoon Apothecary product. This is the best cleanser for me. It is so moisturizing and makes my skin so soft. The ingredients very gentle. I will recommend to my friends. However, the price a little bit high. I've been using this for several months now and I do like it. I wanted a local, natural product, so I'm happy with that. It has a nice lavender smell that's not overpowering and it does a nice job cleaning. I'm mid thirties and prone to monthly breakouts, but haven't had any while using this wash.